The following article from "The State" newspaper of Columbia, South Carolina, was reprinted in the "Omaha World-Herald", August 15,2003. It describes a phenomenon taking place all over the United States. Namely, fancy entryways are being used as one of the design highlights for premium residences. The article is still accurate even a few years later except that the cost of fancy doors and the value that they add to a fine home have continued to go up. Are you taking advantage of this trend to have your house say what you want it to about you? COLUMBIA,S.C. - They're not simply front doors anymore. They're "entryways". Front doors are getting taller and wider. The size of the average American new home dropped slightly in 2002, but the size of the average American door grew 7 square feet. Custom entryways often are handmade, using solid woods such as mahogany, cherry, walnut or teak. Dramatic transoms and sidelights surround them. And they aren't necessrily rectangular - rounded tops are gaining popularity. Custom-made entryways average about $2,500 to $5,000 but some doors can top $15,000. As with much in your home, the sky's the limit. "It is the main thing someone sees when they come up to your house. It makes the statement of your house," said Nancy Mauney of Carolina Custom Homes in Columbia. "If you have company, they stand there waiting for you to come to the door." Scott Brown of Brown Webber Homes agrees: "To me, it's the cover of the book. It's the first thing you focus on as a guest coming to a new house." The standard front door traditionally has been 6 feet, 8 inches tall by 3 feet wide, but it's not uncommon now for doors to be 8 feet tall and 4 feet wide, with some doors soaring to heights of 15 feet. Changes in home design drive the large door sizes. The trend toward 10-foot ceilings can cause a standard door to look out of proportion with the house. And sometimes one door won't do. "In upscale homes, there's a definite trend toward double doors," said Gopal Ahluwalia, spokesman for the National Association of Home Builders. 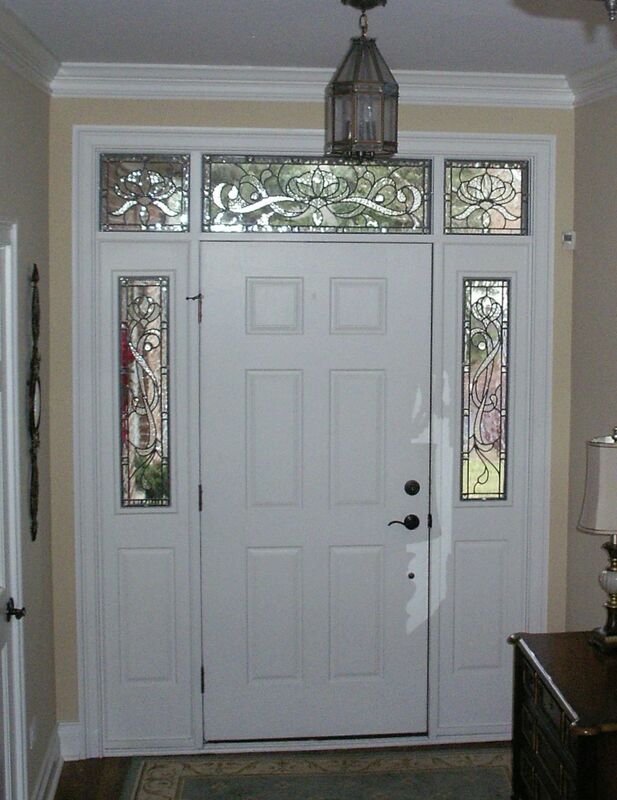 "The consumer wants to make a big impression with the front door and entry foyer." Mauney said doors are just one of the custom items buyers want. Homes may be getting smaller, but people are putting more specialized items into them. "I think it's the Internet, it's TV, it's Home & Garden TV. People see all these things they want and add them to their house," she said. "People are putting more expensive amenities into their house than they did 10 or 15 years ago." Ahluwalia has notice the same trend. "There's no question that people are wanting to impress somebody," he said. "But that's getting to be true with everything in the house." Brown, of Brown Webber Homes, said that when buyers come to him to build a house, they generally haven't thought about a door. But there are exceptions. He is building a home for a customer who is basing the home design on a door. It's a double mahogany door with raised glass panes. "It takes two people to carry each door unit," Brown said. For some people, touches such as custom-made doors are what makes a house. "They are expensive; you won't find them in a less expensive home," Mauney said. "But like I say, we're seeing the boomers build their houses now, and they want it laid out differently. They want space designated differently than when they had kids. And they'll sacrifice square footage to get amenities and quality they're looking for."